We ♥ Gutenberg: Get Answers to All Your Questions Regarding Gutenberg & Elementor. The new Gutenberg editor is here, and we know this is intimidating for many WordPress users. Gutenberg naturally raises questions and concerns, some directly related to Elementor. In this doc, we want to help fill in all the blanks regarding Gutenberg, and how it is going to play out in relation to Elementor. 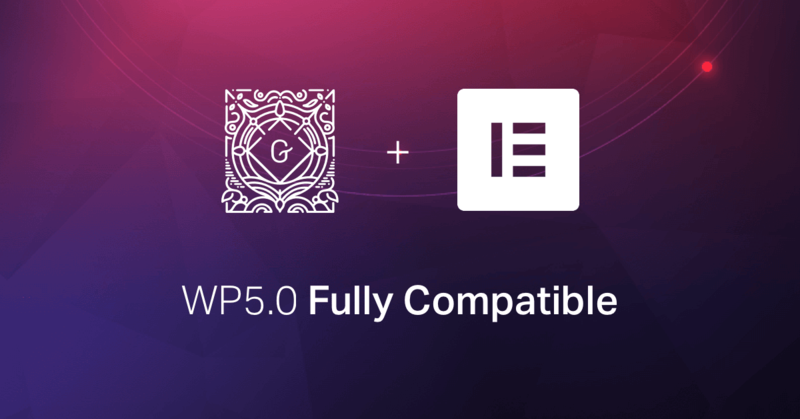 Gutenberg is the replacement of the old Wysiwyg editor, allowing users for a much better writing experience when creating content on WordPress. This way, you can easily add image, videos, headlines, buttons and other elements besides your text. A post in Gutenberg is a collection of blocks, and this new structure is what makes it easier to create rich content in Gutenberg. Does Gutenberg replace Elementor? What is the difference between them? No, Gutenberg does not replace Elementor. While they share the fact that both are editors, there is a fundamental gap between them. Elementor is a solution built for designers. If you need to design a website - use Elementor. Gutenberg has been created in order to improve the user experience of the former WordPress editor, making it easier for bloggers and content writers to embellish their posts with images and other types of rich media. Will I need to use Gutenberg once it is launched, or can I stick strictly to Elementor? You can continue to use Elementor, just like you are used to. What about the Classic WordPress editor? If you are reluctant to use Gutenberg, you will still have the option to revert back to the previous editor. Having said that, we strongly encourage you use Gutenberg. How does Gutenberg affect the future direction of Elementor? We feel like Elementor played a part in substantiating the role of visual design in the experience of every WordPress user. This encourages us to continue to develop Elementor in the same direction we started, opening new realms of possibilities to design in WordPress, some never before seen. How will the two interfaces work together? Elementor and Gutenberg already work seamlessly together. As a user, you can easily decide which editor you use at every point while editing your site. Build a blog post layout in Elementor, then implement it, so every new post you write with Gutenberg automatically gets the design from Elementor. You can also easily embed Elementor blocks on any Gutenberg page. Will I be able to use Elementor inside Gutenberg or vice versa? Yes. Check out our Elementor Blocks for Gutenberg plugin in the WordPress repository. Are Gutenberg blocks going to show up when I drag a Text widget into my page? No. The text editor widget stays the same. Will there be corrections in Elementor-built websites once Gutenberg is launched? Will I need to make updates to my pages? No, there won’t be any changes. In terms of designing in Elementor, your sites and pages will remain the same, and you will be able to continue just where you left off.